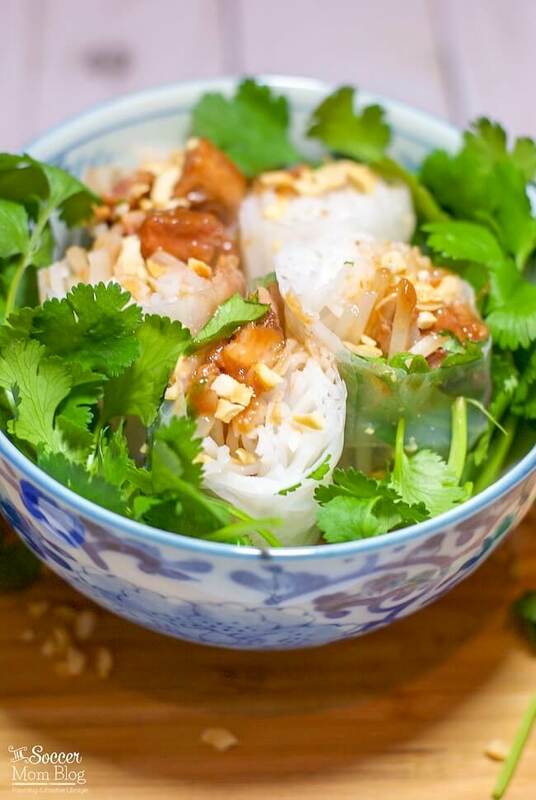 Vietnamese Spring Rolls - They're easy with this video demo! 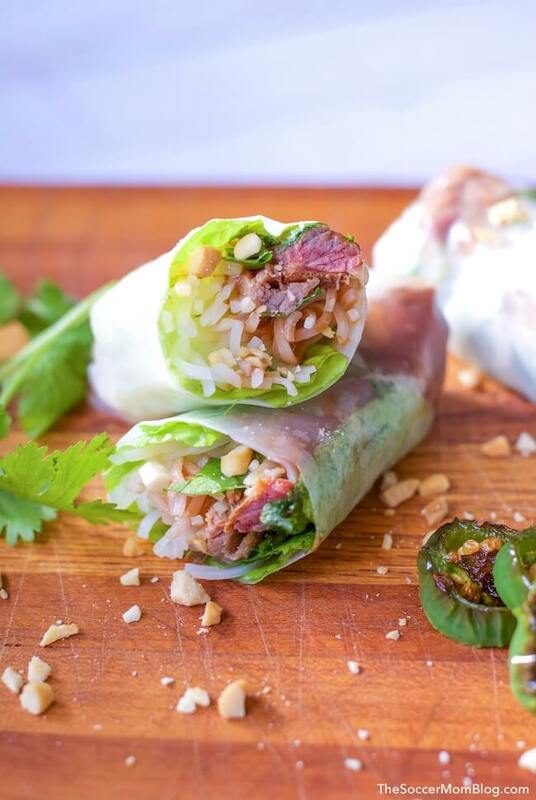 Vietnamese Spring Rolls – They’re easy with this video demo! 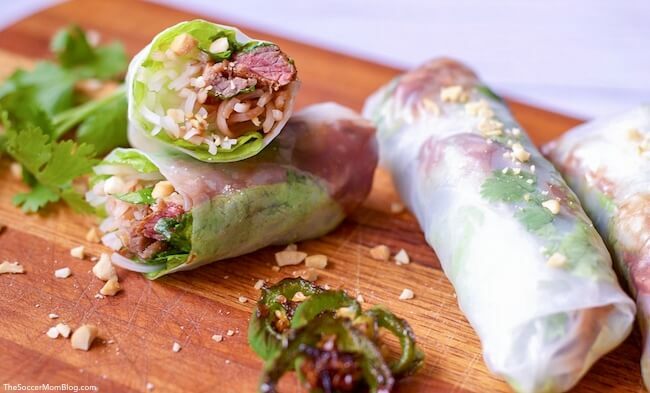 Home » Recipes » Vietnamese Spring Rolls – They’re easy with this video demo! Think Vietnamese Spring Rolls are tricky to make? Think again! Watch our video demo to learn how to roll fresh spring rolls, plus we have a photo step-by-step Vietnamese Spring Roll recipe too! One of our favorite fresh appetizer recipes! When the folks at Curly’s BBQ reached out to me to team up this year I was absolutely thrilled! 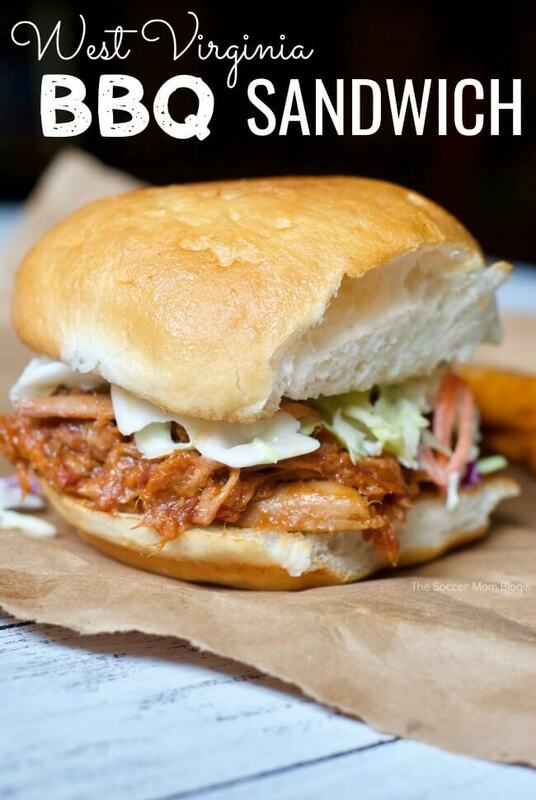 Living in Texas, barbecue is a way of life. However, there’s so much more to this state and I’m excited to share what I’ve learned about food here. 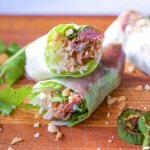 These Vietnamese spring rolls made with BBQ pork perfectly represent my home of Houston, Texas — a diverse food destination that always stays true to its Texas roots. A little bit Texan, a little bit Asian fusion, and a LOT of flavor! A local Vietnamese restaurant is actually the first place my husband and I went on a lunch date together — almost 10 years ago. Vietnamese food is still one of our favorites, so we studied up on how to make fresh spring rolls at home. What are Vietnamese Spring Rolls? 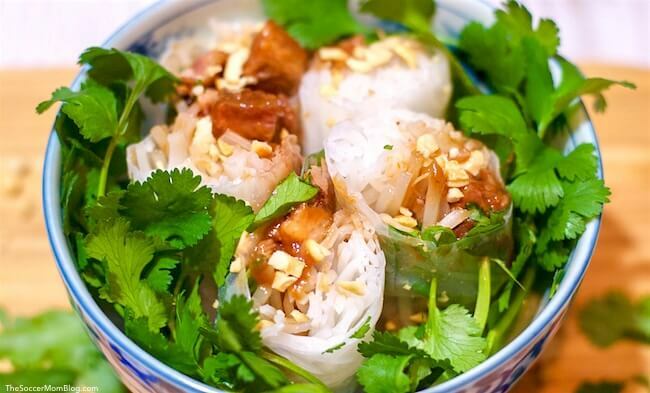 Vietnamese spring rolls are generally pork and/or shrimp and fresh vegetables, wrapped in rice paper. Unlike Chinese-stye spring rolls, Vietnamese spring rolls are not fried and are served cold. I thought they would be difficult to because Vietnamese spring rolls look like works of art! However, I watched a lot of videos and practiced and quickly got the hang of it. And if I can make fresh spring rolls, you can too! 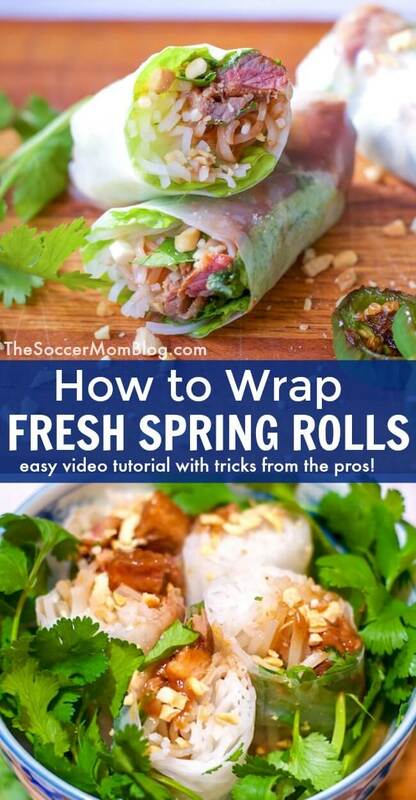 Keep reading for a photo step-by-step guide to make our easy Vietnamese spring roll recipe, plus a video tutorial that will show you how to wrap fresh spring rolls like a pro in no time! 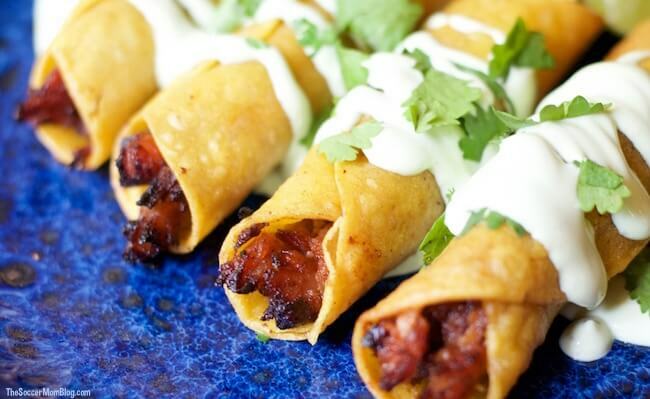 Related: For another one of our favorite Asian-fusion recipes, try our Crispy Pork Wontons! A free printable copy of the full fresh spring roll recipe and ingredient list is available at the bottom of the post. Keep reading for photo step-by-step instructions and prep tips or click here to jump to printable recipe and video. STEP ONE: Run a clean kitchen towel under running water until completely saturated. Wring out all excess water. Spread damp towel over a medium cutting board and tuck towel ends under the cutting board to hold in place. This will be your rolling area. STEP TWO: Pour contents of the Curly’s package into a medium mixing bowl (the Kansas City Style Seasoned Brisket Burnt Ends are already in sauce). Stir in soy sauce and sriracha until well combined. Set next to your work area. I’m a huge fan of Curly’s Road Trip Eats because they take the work out of preparing barbecue (which can be an all day thing!) Even though this brisket is pre-cooked, the flavor is on-point. Trust me, I’ve tasted a lot of barbecue! You can find the Curly’s Road Trip Eats line in your grocer’s refrigerated meat case. STEP THREE: Take one sheet of rice paper and hold under running water for 3-4 seconds. 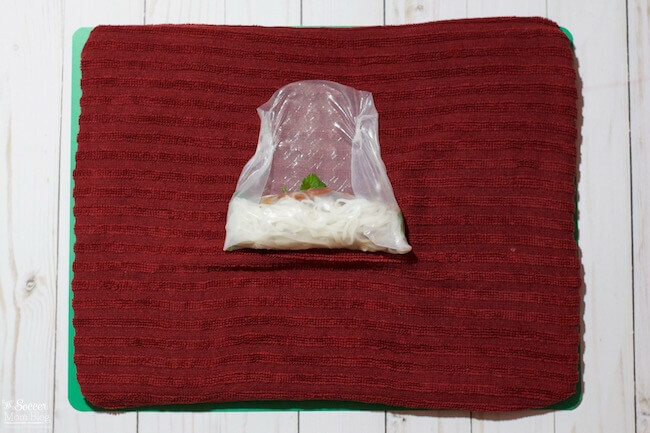 Lay the wet rice paper sheet onto your damp towel. STEP FOUR: Place spring roll ingredients in a line (about 1 inch wide) across your rice paper sheet, about 1/3 from the bottom. (We used 1 large lettuce leaf, about 1/4 cup noodles, a few sprigs of cilantro, handful of beansprouts, and 2-3 tablespoons of brisket). STEP FIVE: Fold and tuck the bottom of the rice paper over your filling. The rice paper should be soft and easy to work with now. STEP SIX: Fold sides of rice paper inwards (about 1″) towards the middle. Keep sides parallel to each other. 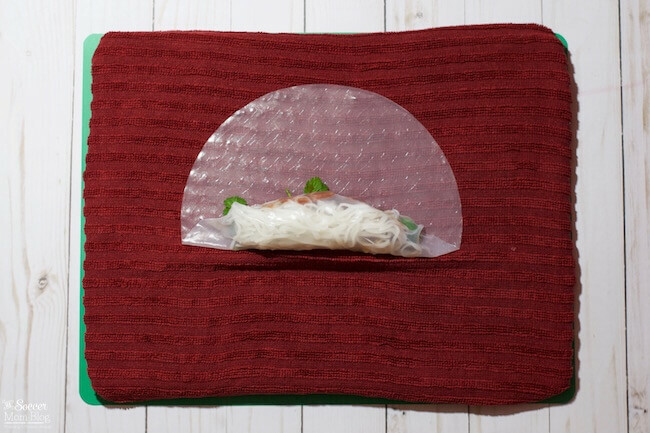 STEP SEVEN: Roll your spring roll from the bottom up — it should self-seal as you go. Serve with grilled jalapeños and/or crushed peanuts for garnish. Think Vietnamese Spring Rolls are tricky to make? Think again! Watch our video demo to learn how to roll fresh spring rolls, plus we have a photo step-by-step Vietnamese Spring Roll recipe too! Run a clean kitchen towel under running water until completely saturated. Wring out all excess water. Spread damp towel over a medium cutting board and tuck towel ends under the cutting board to hold in place. 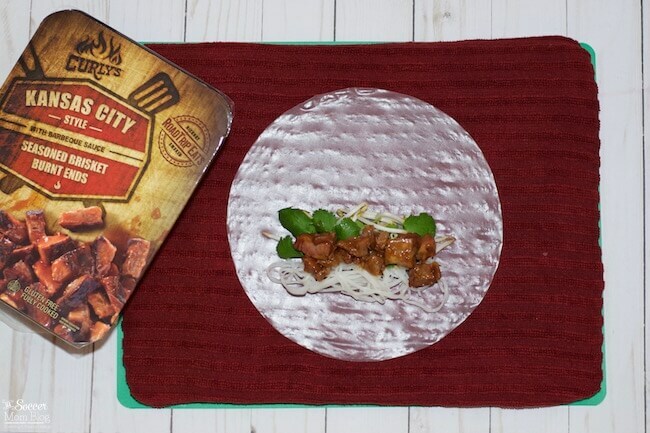 Combine Curly's Kansas City Style Seasoned Brisket Burnt Ends and their sauce in a mixing bowl with soy sauce and sriracha. Stir until well mixed. Hold one sheet of rice paper under running water for 3-4 seconds. Allow excess water to drip off, then lay the still-wet rice paper sheet onto your damp towel. Place spring roll ingredients in a line (about 1 inch wide) across your rice paper sheet, about 1/3 from the bottom. (We used 1 large lettuce leaf, about 1/4 cup noodles, a few sprigs of cilantro, handful of beansprouts, and 2-3 tablespoons of brisket). 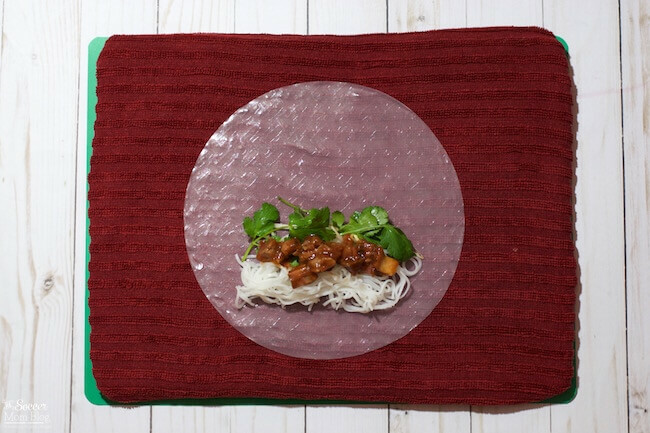 Fold and tuck the bottom of the rice paper over your filling. The rice paper should be soft and easy to work with now. Fold sides of rice paper inwards (about 1") towards the middle. Keep sides parallel to each other. Slowly roll your spring roll from the bottom up — it will self-seal as you go. Do you have a favorite dipping sauce for spring rolls? Share your favorite “secret sauce” recipe in the comments below – I’d love to try it!